By default the latest Windows versions automatically install new updates, including driver updates. And although updating your PC software in general is a good idea to ensure maximum security an performance, there are cases where driver updates are not desirable. Some hardware only operates with a specific driver version, other hardware devices need a specific driver version to ensure all functionality is available. You wouldn’t want a driver update to suddenly remove features. 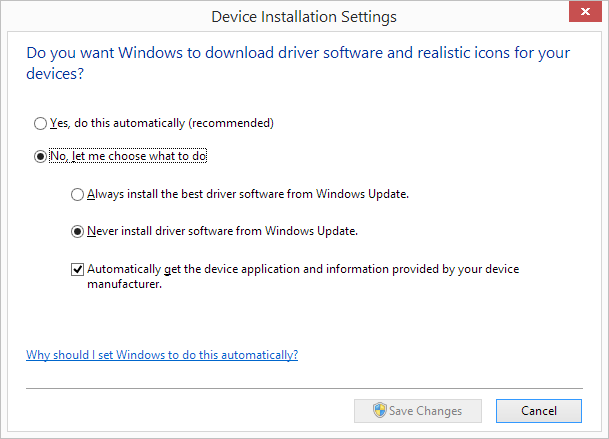 If you find yourself in a situation where you want to decide which driver updates to install and which ones not, you can disable the automatic driver updates in Windows. To do this, open the Control Panel and go to System and Security. Next, select the System option, and click Advanced system settings. In the System Properties windows, you need to select the Hardware tab. Now click the Device Installation Settings button. 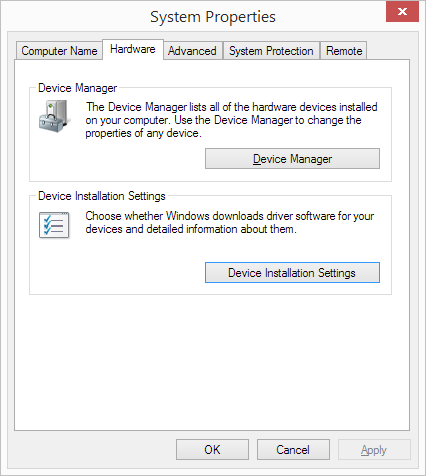 This will bring up the Device Installations Settings window. Here you will need to change the option from Yes, do this automatically to No, let me choose what to do. And then select the option Never install driver Software from Windows Update. Next, click the Save Changes button. After this Windows will still install regular software updates, but no longer automatically update the drivers on you system. Of course we recommend checking and updating your drivers with our DriverFinder sofware, so you can decide which updates to install and which not!